A boater in the Chicago area has found the ideal platform for viewing the city from the water. Chicago is a boating city. Flanked on one side by Lake Michigan and located at the head of a canal that opens the Great Lakes to heartland America, it’s also within easy reach of the many inland lakes for which the Midwest is famous. 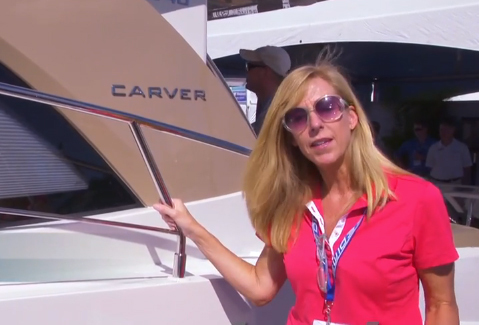 The Carver 380 Santego had everything Kip Benson wanted. The Carver was selling for $110,000, and the vessel was in turn-key condition — well cared for by its owner and with just 200 hours on the engines and 100 hours on the genset. 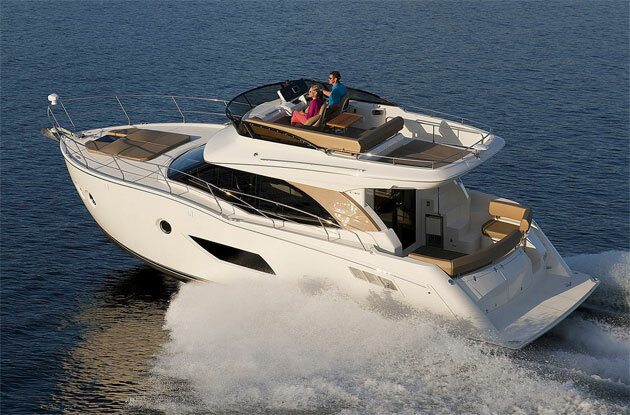 But as Benson stood on the big, open flybridge, two small features really stood out. “The walkthrough from the helm to the bow, and the great visibility from the helm station,” he says. “They were selling features.” The bridge is also a great place for entertaining, seating up to 10 for a day cruise or dock-side get-together. 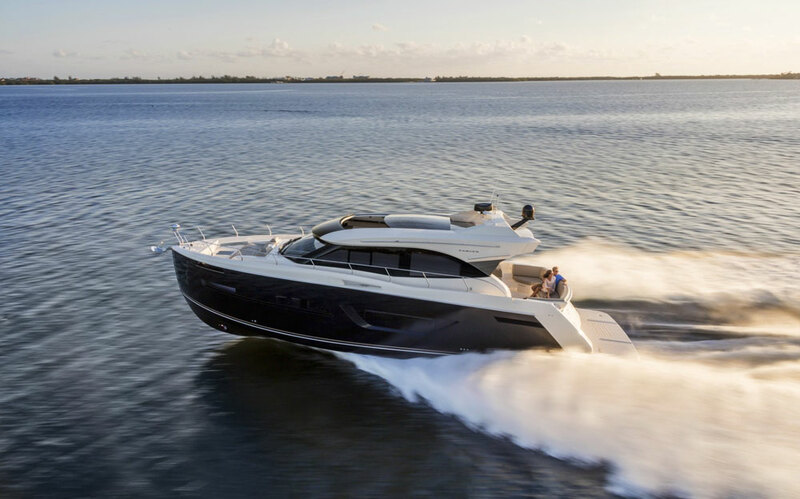 The 380 Santego can sleep up to six and has a fully equipped cruising galley and an enclosed standup head with a shower — all the desired amenities, says Benson. Power comes from a pair of 350-hp gasoline inboards, coupled to V-drives. “I like to cruise at about 3,000 rpm, which is about 17 to 19 knots depending on wind speed and direction,” he says. 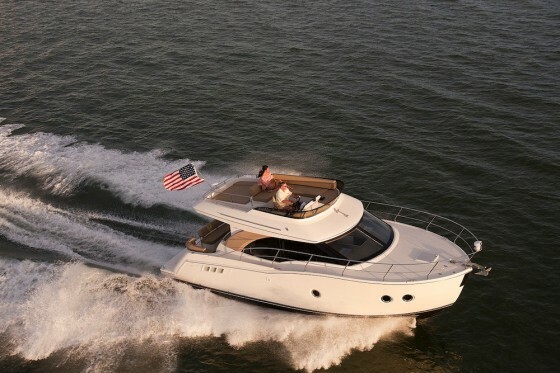 “The [40-mile] cruise from the dock at Waukegan down to the city takes two hours and about 40 gallons of fuel.” His current slate of electronics includes a combination GPS/radar, autopilot and fishfinder. He’s only owned the boat for a season, so no major projects have come up. But he has had the chance to make a few changes — and plans a few more. Routine maintenance has been the norm: engine and genset oil changes, replacing the starboard blower motor, and changing fuel filters, he says. “The genset also had some difficulty operating under load, so I was able to change the impeller, air filter and adjust the carb, and it seems to be running happily now.” Projects for next year include a stereo system overhaul, installing a better freshwater pump, and adding a new GPS and console-mounted VHF. 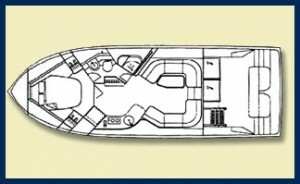 Considering the contemporary Euro styling of current Carver yachts, the 380 Santego has a conservative look, with a low profile, long foredeck and a moderate cockpit. 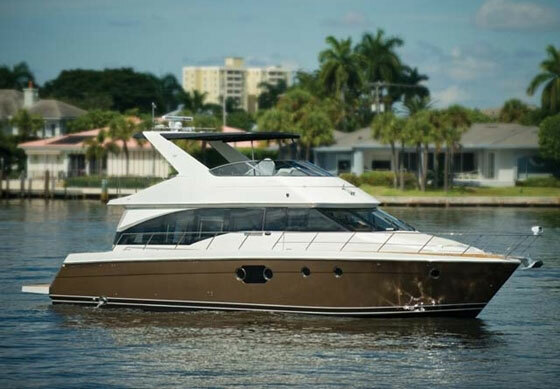 The popular family weekender and cruiser was known for its large, open flybridge, accessed via a ladder from the cockpit, as well as from the foredeck through a walkthrough. The helm station is on centerline, and there’s ample room for a full slate of electronics and engine gauges. 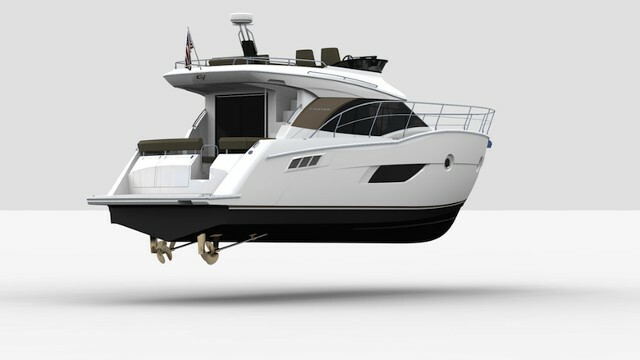 Flybridge seating is on port and starboard benches. The cockpit has seating for three, and steps on each side lead down to the swim platform. Triple deck panels allow easy access to the engines below, and sliding glass doors open to the saloon. There’s a couch that converts to a berth, which can be closed off with a privacy curtain. The galley is amidships, to port, and can be equipped with a stove, oven, microwave, refrigerator and other amenities. The large, booth-style dinette is to port. The master stateroom forward has an island double berth, a pair of hanging lockers and additional storage. The head is forward, to starboard, adjacent to the master cabin. Its two doors open into the saloon and cabin. 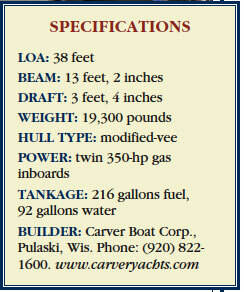 The Carver 380 Santego can be found on the used boat market in every corner of the country. 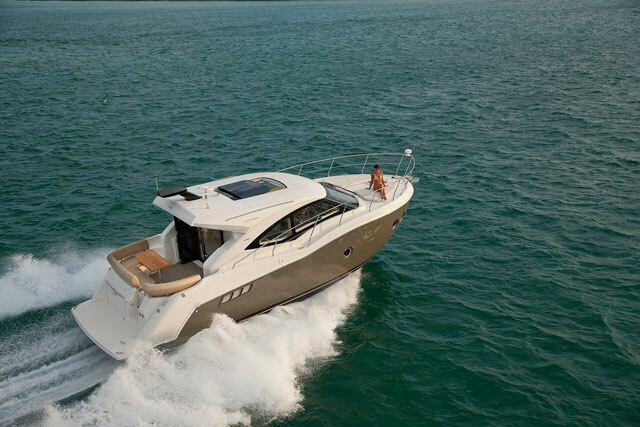 Prices run from around $80,000 for early models up to around $180,000 for 21st century boats. 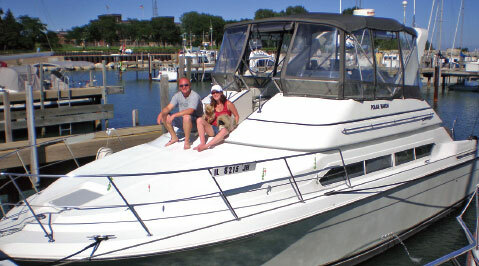 A 1990 Santego was for sale in Wisconsin for $79,900, pow-ered by a pair of MerCruiser inboards. The galley was equipped with a stove/ovenand a full-size refrigerator, and an icemaker enhanced the cockpit wet bar and sink. A “meticulously maintained” 1992 Santego for sale in Connecticut at $101,000 was powered by twin 430-hp Volvo 4.7-liter diesels for a 30-plus-mph top end. It came with a 6.5-kW generator, three-burner stove, full-size refrigerator and oven, wet bar with ice-maker, and a stereo system. In California, a 1997 Santego with twin 330-hp Crusader 454s (around 600 hours) was selling for $119,000. It came with a full Bimini and enclosure, cockpit bench seat and an entertainment center with television. A 1999 Florida boat had a $170,000 price tag, which included a pair of low-use (200 hours) 330-hpCummins diesels, air conditioning/heat, icemaker, coffee maker and an inflatable dinghy on davits. Steve Knauth is a contributing writer for Soundings Magazine. This article originally appeared in the April 2008 issue.